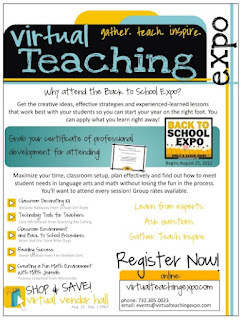 Teaching with TLC: The Back to School Expo is coming soon! The Back to School Expo is coming soon! Treat yourself to a smooth start to your school year by attending the Back to School Expo! Once this event launches, you can watch the event at whatever time works for you! Any day, Any time! A certificate will be provided to attendees for documenting professional development! Grab your tickets today and enjoy the expo!